When is Night in Venice? The parade starts at 7 p.m. on Saturday, July 28, 2018. Where does the parade route begin and end? The boat parade begins near the Ocean City-Longport toll bridge and travels along the bayside to Tennessee Avenue, looping in and out of lagoons along the way. To view the Night In Venice boat parade, grandstands will be set up at street ends along the bay from Battersea Road to 16th Street and also at Tennessee Avenue. These are free and available on a first-come, first-served basis. Streets include: Battersea Rd., North Street, First Street, Second Street Marina, Fourth Street, Sixth Street, 11th Street, 13th Street, 15th Street, 16th Street and Tennessee Avenue. The Bayside Center, 520 Bay Avenue, will be open with a picnic area, snack food for sale and bleacher seating plus live entertainment. Tickets are on sale, $4 for children (ages 3 to 12) and $8 for adults. Gates open at 4:15 p.m. with the Good Tymes Band playing 5 p.m. until the first boats in the parade arrive. Children’s activities include crafts, games and face painting. Tickets may be purchased by cash, check or charge at: City Hall, 861 Asbury Avenue, any day 9 a.m. to 6 p.m. No alcohol is permitted, and no parking is available. Tickets are also available online at oceancityvacation.com/boxoffice. The band will resume after the parade and play until the fireworks start at approximately 9 p.m. The parade is free to watch at all locations except the Bayside Center. Shuttles will drop off spectators at street ends where they can watch the parade and return them to the parking lots afterward. The shuttle also drops off at the Bayside Center. The service is free and will be available until 11 p.m. The east side of Bay Avenue between 14th Street and 16th Street. West 16th Street, West 17th Street and West 18th Street will have parking restrictions in place. Parking regulations will be strictly enforced. Violators will be ticketed and in severe cases, the vehicles will be towed if public safety is affected. This is to allow for safe passage of all pedestrian and vehicle traffic and emergency vehicle access to isolated areas of the bayfront. Can I watch from the Ninth Street Bridge? All pedestrians and bicyclists should use the Shared Use Bike Path and stay to the south side shoulder for viewing. No persons will be allowed to bring chairs for seating onto the bridge. At no time will persons block the free movement of the Shared Use Bike Path. No open alcoholic beverages are permitted on the bridge at any time. Persons are not permitted to walk along the bridge with motor vehicle traffic. Ocean City Police will be present monitoring the bridge while the parade is in progress for assistance. What is the Night in Venice theme? The event’s theme is “TV’s Greatest Hits.” Boats and houses are encouraged to celebrate the best of television history. This is an optional theme. Night in Venice will include a fireworks display launched after the parade from a barge in the bay north of the Ninth Street Bridge, roughly off Third Street. The display should be best viewed from street ends or the bayfront between the Ocean City-Longport toll bridge and 16th Street. Anyone with a boat or anyone with a house along the bayfront parade route can participate by decorating their boat or home. You can register your boat or house online at www.ocnj.us/niv/. Registration is open through 4 p.m. Thursday, July 26. Are paddleboards and kayaks part of the parade? For safety reasons, paddleboards and kayaks are not part of the Night in Venice parade. Who are the 2018 grand marshals? Jackie Evancho: The young singer first dazzled American television audiences at the age of 10 – gaining global recognition with her debut on NBC’s “America’s Got Talent.” She finished as runner-up in that competition and has continued to make history with achievements that include: youngest solo platinum artist, youngest Top 5 debut artist ever in the United Kingdom, youngest person to give solo concert at the Lincoln Center and the highest-ranking debut artist of 2010. All six of Evancho’s albums have hit No. 1 on the Billboard Classical chart. Jon Dorenbos: The former Philadelphia Eagles long-snapper gained the attention of the non-football world during his run to the top of the NBC television competition “America’s Got Talent.” He placed third overall in the contest after surviving many elimination rounds. The 14-year NFL veteran says magic saved his life, and he has a story to back it up. When he was 12 years old, his father murdered his mother. He openly shares this childhood tragedy with audiences in an inspirational show about rising through adversity, setting goals no matter how high, and planning the necessary steps to achieve those goals. Laurie Hernandez: Hernandez is the first U.S.-born Latina to make the U.S. gymnastics team since 1984. She brought home gold and silver medals from the 2016 Rio Olympic Games. After winning her “Dancing with the Stars” title with Maks’ brother, Val Chmerkovskiy, she published her first book, “I Got This: To Gold and Beyond,” which hit the New York Times Best Sellers list. Who else is in the parade? The cast of “Beauty and the Beast” (presented by the Ocean City Pops and Ocean City Theatre Company from August 7 to 10), the OCTC Show Choir (performing a medley of TV theme songs), city officials and scholarship pageant winners will be part of the lineup. What else is happening on Night in Venice Weekend? Master Dance Class with Maks Chmerkovskiy: The famous dancer will provide instruction for intermediate to experienced dancers. 9 a.m. and 1:30 p.m. July 28 at the Ocean City Music Pier. Meet-and-Greet with Laurie Hernandez and Maks Chmerkovskiy: Chmerkovskiy joins Hernandez to greet fans. 11 a.m. at the Ocean City Music Pier. Jon Dorenbos Magic Show: Dorenbos will perform a show that mixes his mind-blowing magic talents with inspirational stories. 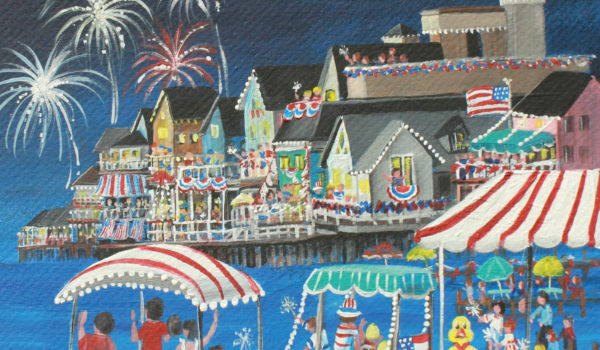 The show is set for 8 p.m. Friday, July 27 at the Ocean City Music Pier. Tickets are $32 to $47. Jon Dorenbos Meet-and-Greet: Meet Dorenbos, get an autograph and a photo. Session ($20) is at 4:30 p.m. Friday, July 27. Jackie Evancho with the Ocean City Pops: A special Ocean City Pops performance on July 29 will feature the remarkable vocal talents of Jackie Evancho. She will perform with the Ocean City Pops orchestra 7:30 p.m. July 29 at the Ocean City Music Pier. Tickets are $30 to $45. Visit oceancityvacation.com/boxoffice, call 609-399-6111, or stop by the Music Pier Box Office or any of the city’s welcome centers to purchase tickets for these events.